In the 2017-18 season, current sophomore classmates forward Jesse Compher and goaltender Corinne Schroeder each enjoyed successful freshman seasons last winter on the Boston University women’s hockey team, capped off by nods to the Hockey East All-Rookie Team. BU head coach Brian Durocher said that despite their underclassmen status, Compher and Schroeder will be players he looks to. Both have spent time representing their countries in international play, as Compher sported the red, white and blue for the U.S. Under-18 team in the 2017 IIHF Women’s World U18 Championship while Schroeder was on the other end playing for Canada. Compher tied for third on the Terriers with 26 points on nine goals and 17 assists last season, which ranked fifth among Hockey East freshmen in PPG. The Northbrook, Illinois, native’s freshman campaign included the game-winner in BU’s Beanpot semifinal win over Harvard University, a shorthanded goal in the team’s Hockey East playoff win against the University of Maine and a two-goal performance in the Nov. 28 win over Brown University. Over the summer, Compher was invited to the USA Hockey Women’s National Festival in Lake Placid, an event used to determine rosters for a series of games against Team Canada. At the conclusion of the National Festival, Compher was one of 22 players chosen to play for the U.S. Under-22 Select Team against Canada. She was part of a three-game sweep in Alberta, continuing USA Hockey’s streak of success against Canada in international play following its 2018 Olympic gold medal. Jesse isn’t the only Compher to put on the USA Hockey sweater — her brother, J.T. Compher, played with the United States National Development Team for two seasons before playing NCAA hockey and has represented the United States in six IIHF events. He spent three seasons at the University of Michigan and served as a co-captain during the Wolverines’ 2015-16 season, where they played for a 25-8-5 record, clinched the program’s first Big Ten conference title and made a NCAA Tournament push to the Midwest Regional final. J.T. now plays for the Colorado Avalanche and earned a point in two of the first three games this season. Backing Compher and the rest of the Terriers in net will be Schroeder, who held a .913 save percentage through last season. 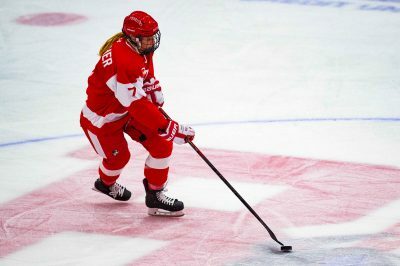 The Elm Creek, Manitoba, native comes into the season after honing her skills in Hockey Canada’s Women’s Development Team Selection Camp in August. Over three days at the selection camp, Schroeder saved 45 of the 50 shots that came her way for a .900 save percentage. 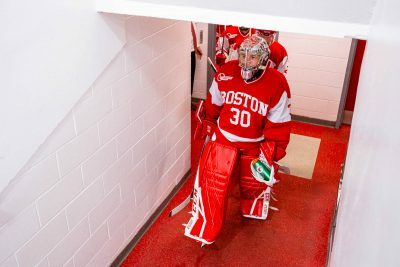 Schroeder has started both games so far for BU, including 35-save performance in a 3-3 tie against Northeastern University. Compher produced two points during the game off a goal and an assist during the game and is second on the team in shots. Despite the two sophomores’ success so far in their careers, Schroeder said that talent and productive power are spread throughout the roster.